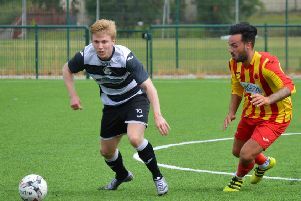 There was a point before the end of East Stirlingshire’s 6-0 Lowland League win over Stirling University at Forthbank Stadium on Saturday when Martin Mooney allowed himself a sigh of relief. The Shire assistant coach was tasked with continuing the club’s unbeaten run of 19 league games in the first two matches of the new campaign while gaffer John Sludden headed to Spain for his son Paul’s wedding. Having safely negotiated a 1-1 midweek draw in their league opener against BSC Glasgow, Mooney then watched on as Shire built up an impregnable lead against the students before thinking to himself, “job done”. Sludden will be back in the dug out for the visit of Whitehill Welfare to the Falkirk Stadium this weekend and it will be his responsibility to extend the Shire’s run to 22 games unbeaten. Mooney admitted this week that his short spell at the helm did come with the anxiety of protecting the record. “It certainly was a factor for me,” said the Shire number two. “We were 5-0 up at half-time on Saturday and that was the moment when I relaxed a bit and thought I had done my bit. While some considered Shire fortunate to emerge from the BSC game with the unbeaten run still intact, Mooney was delighted with the response his players gave against Stirling University just a few days later. “It was chalk and cheese, night and day”, he said of the improved performance level. That said, Mooney admitted it could have been different had the students converted a penalty kick when Shire’s lead was just 1-0. Keeper Jamie Barclay made sure it stayed that way with a fine save from the spot kick. What did matter was making sure that Shire stood the chance of starting their third Lowland League campaign in more confident fashion than a year ago, when an indifferent first couple of months cost them a shot at the league title. “One of the things I said to the players before the Stirling game was to make sure that after three or four games we weren’t looking up at teams above us in the league table.